Mike Edwards is on the hunt for his next CEO position. He didn’t come to LeBow this week to hand out resumes, though. The former CEO of Borders and eBags unfolded tales of his life in business, along with a few key bits of clear-eyed wisdom, to several classes of Drexel LeBow undergraduates. 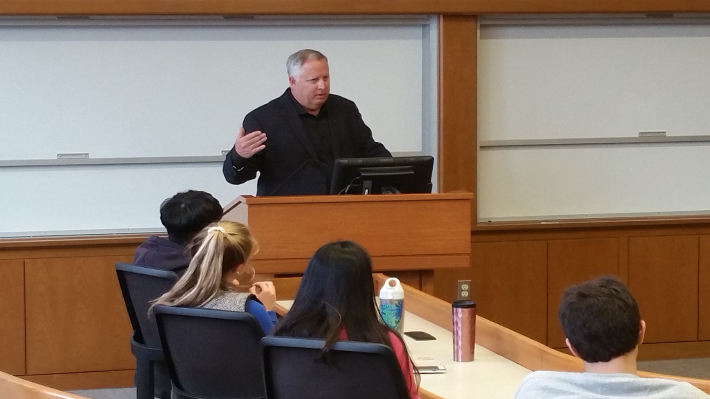 Students enrolled in Foundations of Business, Entrepreneurial Law and Consumer Behavior classes received a whirlwind tour – “30 minutes, 35 years” according to Edwards’ calculations – of his career since graduating from Drexel in 1983, with his various stints as a CEO as highlights. Edwards’ remarks were honest and self-effacing, punctuated by exclamation of “wow” in both wonderment and disbelief at the highs and lows he’s traversed, particularly during the collapse of Borders in 2011. Edwards highlighted other connections to his alma mater, including citing Bennett S. LeBow ’60, the University’s largest benefactor and namesake of LeBow College of Business, as a mentor and investor; LeBow served as Chairman of the Board and is also a former CEO of Borders. He also noted that his recent nomination to Drexel’s Board of Trustees stands out as “one of my top one or two honors,” alongside receiving an American Heritage Award from the Anti-Defamation League. Following this frank and wide-ranging talk, Edwards weighed in on larger business-world issues, like the battle for supremacy between Amazon, Google and Facebook, while answering a lively stream of student questions.